This house is located on Chartres Street, in The French Quarter. Both Confederate General Pierre Gustave Toutant, who ordered the first shot at Ft. Sumter, and Frances Parkinson Keyes, a noted author, resided in this home after its construction in 1826. Now days, during the day, tourists wander through its rooms where Keyes’ extensive doll collection and many confederate artifacts are kept. At night however, folks claim to have seen ghostly visitors from eras past. People clasay that after the tourists leave, the house becomes filled with a supernatural gore-fest that depicts the reenactment of the Battle of Shiloh. Although, no battles were ever fought on this site, the General did write detailed reports of the horrors he’d witnessed while he lived here. Apparitions of men with mangled limbs, and injured horses and mules have plagued the house for years, along with the pungent aroma of death. The house also claims a ghost dog and ghost cat who are often seen by the caretakers. They believe these animals were owned by Keyes during her time in the home. An Italian family once made the place their residence. They were run out in the middle of the night in a hail of gun fire by unknown assailants. Since that time, the sounds of parties and moving furniture can be heard throughout the night. Is it possible that the prior residents have left their imprint on the place? Why is it that some buildings seem to soak in the stories of their owners while others don’t? 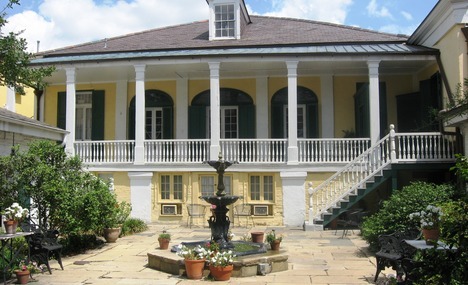 The Beauregard-Keyes house has such a rich history that it is definitely worth a visit the next time you are in New Orleans!